A robotics company has built an android child called David. It is said that it has the capability of love. David is a prototype and is given to a family whose son is in a medically induced coma. David bonds with his human mother, but when her biological son suddenly recovers, it causes strife in the house. As she increasingly fears for her son's safety, she abandons David in the forest and leaves him to fend for himself alone. A passion project over 20 years in the making, "A.I. 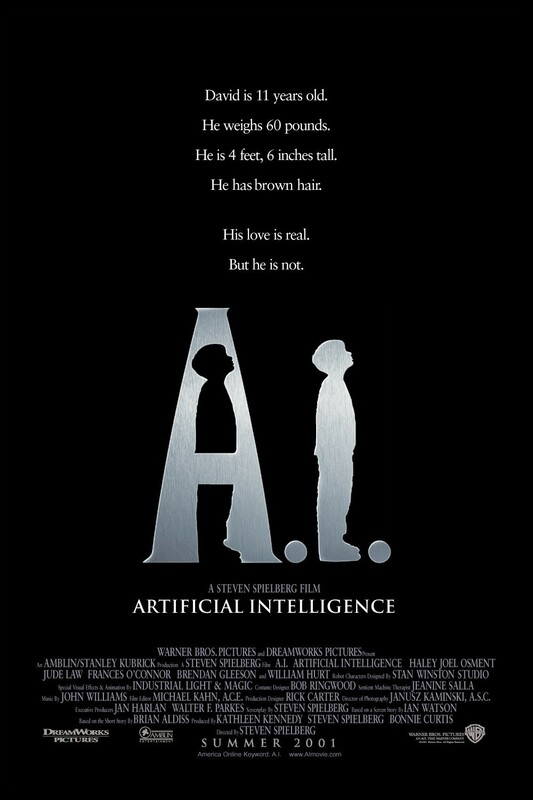 Artificial Intelligence" is directed by Steven Spielberg. It is based on the short story "Supertoys Last All Summer Long" by Brian Aldiss. This film was originally brought into conception by Stanley Kubrick in the late 1970's. Steven Spielberg was asked to direct the movie in 1985, but had a very busy schedule and convinced Kubrick to shoot it himself. The project got stuck in development hell, waiting for the day when technology would catch up with Kubrick's vision. It didn't officially start filming until August 2000 with Spielberg back at the helm more than a year after Kubrick's death in 1999. 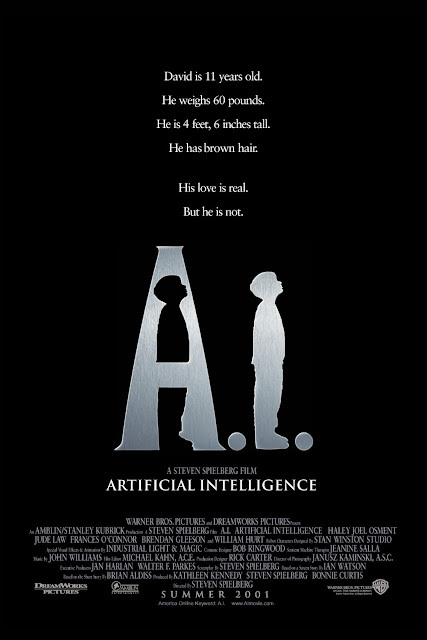 This film stars Haley Joel Osment as David, an artificially intelligent android designed to unconditionally love whatever person it imprints on forever. The Swinton family has faced a horrible tragedy. Their young son is in a coma, and they have had to endure the possibility that he may never recover. Henry Swinton (Sam Robards) works for Cybertronics, and the company has given him a prototype 'David' to test out at home. His wife Monica (Frances O'Connor) eventually imprints David to herself, causing him to love her unconditionally. A short time later, Monica and Henry's biological son Martin (Jake Thomas) comes out of his coma and is returned home. This causes a sibling rivalry between the two boys who are constantly at odds and fighting over Monica's affection. Fearing for her son's safety, Monica goes to return David to Cybertronics where he will be destroyed, but can't bring herself to do it. Instead, she releases David into 'the wild' to fend for himself. Due to his imprinting, David's only hope is to one day be reunited with the human mother he loves so dearly. "A.I. Artificial Intelligence" is probably best described as a cyberpunk version of "Pinocchio." David strives to be a real boy and longs to be loved by his human mother. The film asks philosophical questions about humanity and what it means to be alive. All of the artificially intelligent beings are designed with a certain purpose, but David's sole purpose is to love. As such, he can feel hatred and jealousy. This is by far the most interesting aspect of the film, and Haley Joel Osment gives a tremendous performance in this role. The movie is also visually stunning with special effects that look every bit as good today as the day they were shot, which is quite impressive considering it was made in 2001. Keep in mind, this is the same year "The Mummy Returns" was released and had a ridiculously gigantic CGI Dwayne "The Digital Scorpion" Johnson, which was dated before it ever hit theaters. Some movies that are released now don't look nearly as striking as "A.I." did almost two decades ago. "A.I. Artificial Intelligence" is a little slow to start, but it gets really interesting in the second act. In fact, it becomes a borderline great movie as the third act reaches its climax. It would have remained great if it weren't for its happy, sappy ending during the coda. In some ways, this ending takes away David's humanity and shows a lack of capacity to grow beyond his initial programming. We may feel differently if and when we watch this in the future, but as it stands right now, we found the ending to overly schmaltzy despite its stunning visuals. While the acting, directing and cinematography are all very well done, the movie's final moments add a major flaw in an otherwise solid movie.